So I'm building a standard auto melon farm in the End. It's 11x10 chunks, from building minimum to building maximum. 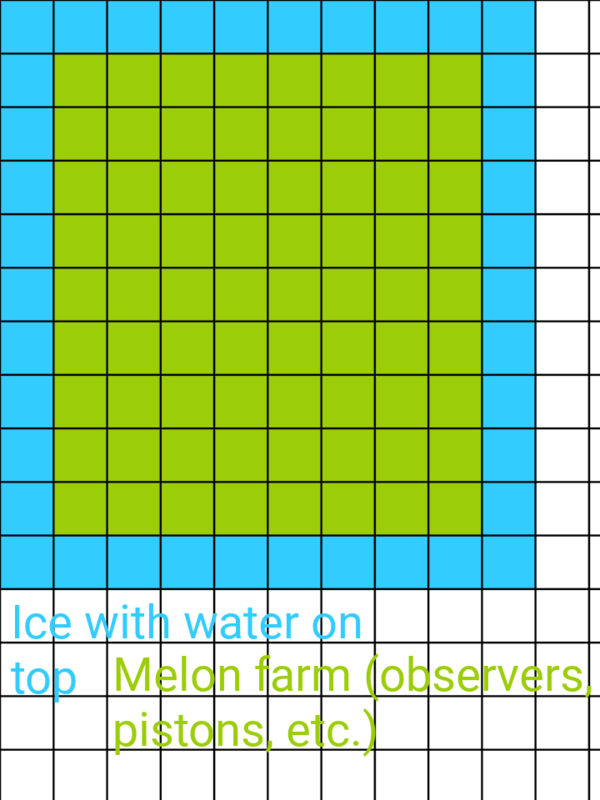 The middle is melon farm and the outside border is just ice with water on top to collect falling melons (see image where each square is a chunk). My question is, what's the best way for me to prevent Endermen from spawning in my farm? I know they won't spawn in the water, but should I worry about the middle where the melon farm is? I thought about using snow golems, but I think Endermen would dodge then and I would need a lot of golems. Then I thought maybe using something like slabs because I heard they can spawn in them, but I don't know how I would fit that into my design. Does lighting prevent them from spawning at all? Endermen are technically hostile mobs so shouldn't spawn in light levels of 8 or above and the Wiki specifically claims that this is true in all dimensions including the end. Did you mean to say they can't spawn in/on slabs? I'm pretty sure iron golems and siege zombies are the only mobs that can spawn in slabs, stairs etc but bear in mind that endermen can teleport so if you REALLY want to keep them all out I think you need to put a 32 block wide zone around the farm where there are no 3 block high spaces where they can fit. Protect your "enderman spawnable blocks" with slabs and that's it. As Hexalobular says, they can't spawn over slabs. Also, he suggests something quite useful: create a 2 blocks high zone around your farm so there will be no space available for enderman, both spawnining nor teleporting. For a melon farm to work one needs blocks of dirt (or one of its variants) next to the stems to receive the melons; also, endermen can grief melons and pumpkins. Putting a roof two above the farm will exclude them (with a lip so they can't reach in past the ice; endermen can grab blocks in a 3-high 4x4 volume centered in the enderman's position). For complete exclusion from a volume (useful if one is concerned with accidently looking at one) teleportation needs to be blocked. "…a 64×64×64 cuboid centered on the current position). It [the enderman] then seeks downwards (regardless of distance, sometimes de-spawning itself) from the chosen destination until the block below is made of a movement-blocking material. The teleportation attempt will succeed to that location as long as no liquid or solid blocks prevent them from standing there"
The volume is a cube, not a euclidean sphere. Also, a single layer of carpet on a solid block will not prevent teleports – two layers are needed. Yes, sorry, that's what I meant. Thank you for all the help! elon farm to work one needs blocks of dirt (or one of its variants) next to the stems to receive the melons; also, endermen can grief melons and pumpkins. Note:The volume is a cube, not a euclidean sphere.Also, a single layer of carpet on a solid block will not prevent teleports – two layers are needed. Wow, thanks for such a detailed answer! Also, I'm playing on a farming server so the bigger the farm the better, but the farm itself is only 9x8 chunks.